It rained last night, which fell like a curtain drawn on summer. I situated myself next to my open bedroom window so I could hear and smell the rain, turned off the lights, poured a glass of wine, and just listened. And as soon as I got myself still and quiet, the clamor inside my head became overwhelming. I can deny it no more: school is back in session, and I had better find a saner rhythm. I will have to go the gym twice today to meet my goal of making it there three times a week while school is in session. My lunch this week was often a little Trader Joe bag of nuts, and when I got home from the golf course (after dropping a 13-seater van off at the maintenance yard that I will have to pick up again 12 hours later), my arms full of binders and papers, I found my dad is sitting there in the dark, alone with his TV. He asks me, “What’s for dinner?” Meanwhile, his caregiver is in the back room, sprawled out on the bed, watching E! or America’s Next Top Model or something. The kids this year are great — I have no complaints. I especially like my seniors. There’s a kid in my AP class who I knew when he was a baby — we lived in the condos at 2507 East Fifteenth Street in Long Beach, and his family also lost everything after the Rodney King riots and foreclosed. A bitter reminder of a bad deal, perhaps, but the kid is interesting…smart and funny, with a little impulse control problem. Today is Saturday. I have to get my feet under myself today if I want to move from reactive to proactive. A work day that I embark on willingly…I need to feel more in control than I do. 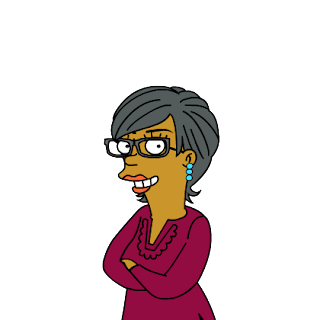 I should be sleeping or planning or grading, but instead, I am creating myself as a Simpson character, and you can too: Simpsonize Me. First dream: I open the door to my classroom, and there is this huge pile of dirt — as tall as I am — in the middle of my classroom. The bell is about to ring, and I HAVE to get the dirt out of my room. I have on my clean, stylish, first-day-of-school outfit, but I grab the shovel anyway (which my dream has conveniently placed right next to the dirt pile) and set to work. When my kids arrive, I am sweaty and covered in dirt. The other dream: I wake up on the first day of school, and is 9:30 a.m. You know in the cartoons when someone steps on the tail of a cat, and the cat shoots straight up in the air, hair pointing in every direction? Yes, that’s me. I have this dream often. Another dream: I am in my classroom before school starts, and I begin writing on the board and thinking about what I have to get accomplished that day. As I write, I sing along with the radio, interrupting my song every once in a while to have a little argument with myself, or to rehearse my opening lines for the lesson. I dance around a little, shake my money maker. And when I turn around, all of my kids have somehow managed to come in and sit down without making a sound…I don’t know how long they’ve been sitting there, but I can tell by their faces that they have seen and heard ENOUGH. I imagine that young people think that teachers return back to school, hippity skippity, la la la, oh my, another fun year of bossing kids around…or perhaps they see us as big beached whales during the summer months, lolling around in the shallow surf and groaning, waiting for that big wave called September to sweep us back to our natural environment. I understand how cowboys must have felt, the night before a long cattle drive. They stare into their bowl of beans, a mixture of anticipation and dread, knowing that in the morning, they are going to have to swing up into the saddle, find their balance, and ride long and hard for months on end, listening to their incessant cow sounds, herding them over gullies and washes, working hard to get to June without losing even one of those precious little cowbabies, even slinging one around their neck if necessary. A very small one, of course. NCLB = No Cow Left Behind.